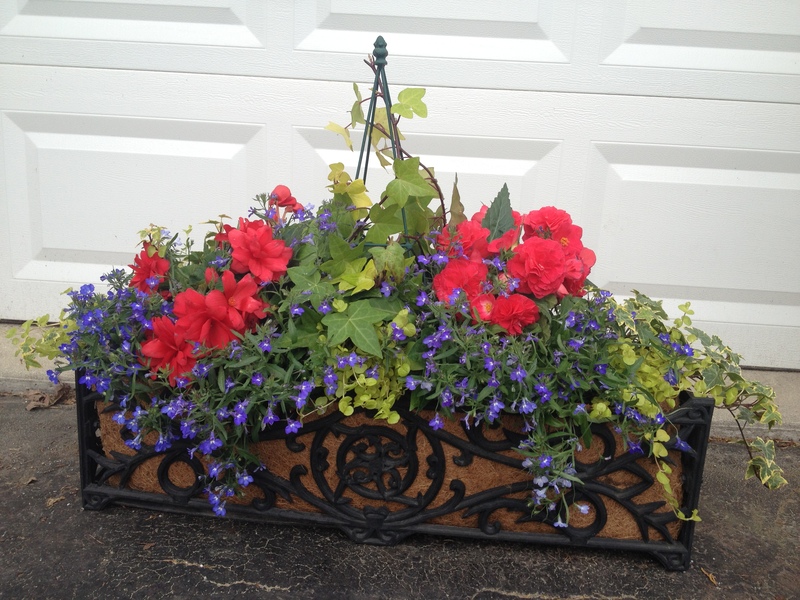 The first picture is Sandra’s window box. It was one of my Early Custom pieces for the summer. I had a request from a lady asking if I could do a gift certificate for a very dear friend of hers. It was to be a very special anniversary gift. I was totally honored and thought what a great thing to do for all involved. 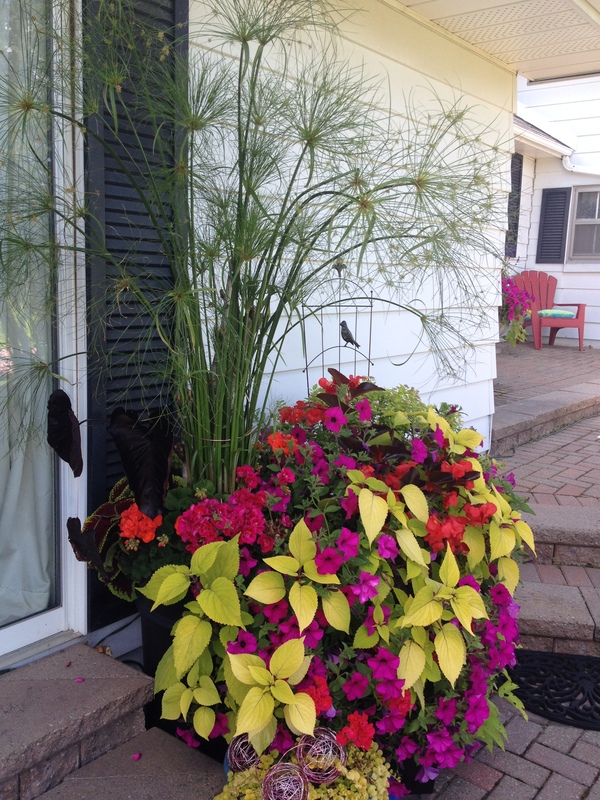 When I was making up the window box, it was a very warm week. Lovely to be working outdoors in early May. 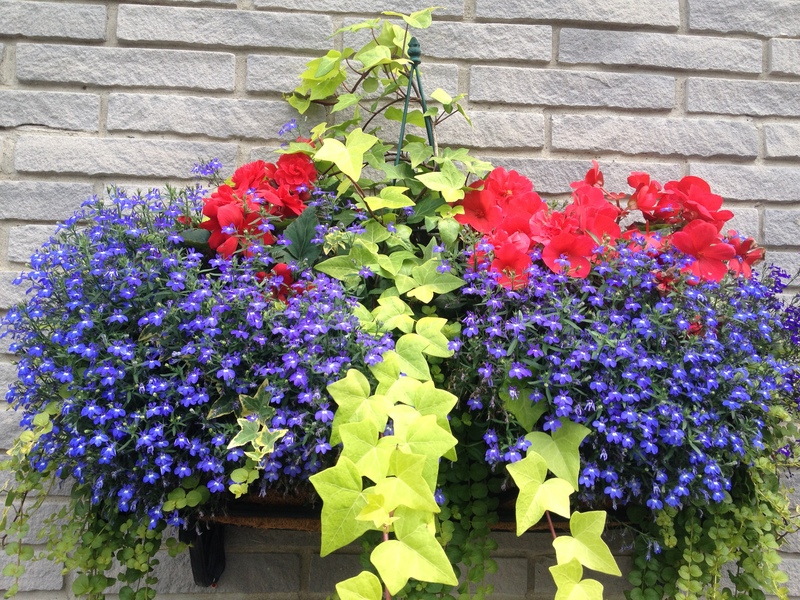 I called Sandra to see if she would like her window box for the early long weekend, in case she was entertaining. Sandra asked if I had seen the weather forecast for the up coming week. I hadn’t but quickly went to check..day time temps, not sooooo bad, night time temps 1 degree celcius!!!…WHHHAT? The weather throughout May continued to be very perculiar. I put off some jobs, which meant I had a lot of catching up to do, but I wanted to be safe from the chilly weather. Tropicals and tender annuals were not going to enjoy that cold. June was also a perculiar month. Much more rain than usual. I was worried that some of the containers I had made up for people were going to rot. But it seems the rain hasn’t affected the plants. You can see from the 4th photo…(Sorry. the photos won’t go where I want them to go!! ;-#) The King Tut Papyrus grass, doesn’t mind the rain in the least. It loves it. Must grow an inch a day. I’m not sure if I particularly like it in this arrangement. It was more of a trail to see what conditions it liked…but you can see from the first photo, of the day I planted this, how much it has grown in ONE month!!! It’s round about this time of the season that some early planted annuals will be getting leggy now. Don’t be shy. Give them a hair cut. Make sure they are well watered, dried out plants make them targets for insects and diseases. Once you have the watering figured out, give them a feed. 15-30-15 plant food. 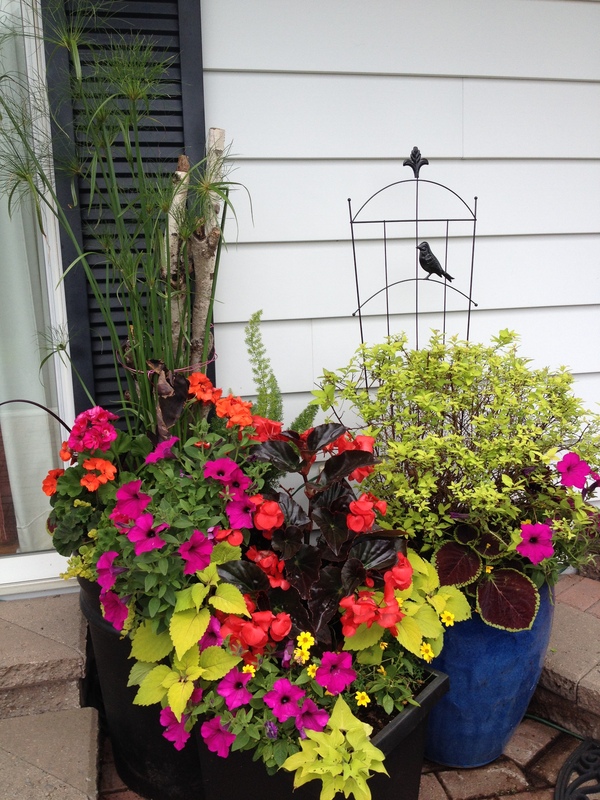 I use slow release fertilizer when I make up my containers, but by this time, they could use an extra shot! Doing this now, will get them through August and hopefully into September. Take a look through my summer gallery to see what other creations I came up with. Stunning, I love the colours. Amazing what Mother Nature can do. We did seem to have a strange summer, but what you have put together here seem to love it.